Nothing says celebration like popping the top of a Champagne bottle with a sword. 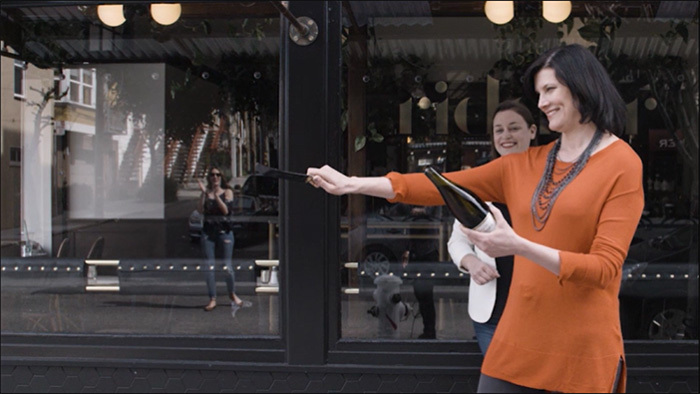 Learn how to safely saber a bottle of bubbly without putting an eye out. It’s a rather handsome image: Napoleon Bonaparte, reining his horse from a gallop to a halt, draws a bottle of Champagne from his saddlebag and a sword from his side. With a swift, practiced stroke, he cleaves off the bottle’s top, which sends both bubbles and shouts of celebration into the air. We’ll never know if sabering a bottle of bubbly (also called sabrage) originated with Napoleon himself. We do know, however, that it came into practice during the Napoleonic Wars, making his soldiers among the first to popularize dramatically knocking the top off a Champagne bottle with a blade (or saber). If you want to go the classic route, there are companies that offer top-notch sabers in a range of prices. Professionals often have also honed their skills, which lend a festive air to celebratory dinners. “We sell a lot of Champagne at the Baccarat Hotel,” says Matthieu Yamoum, the property’s food & beverage manager. He frequently sabers bottles in this New York City venue, whether to toast an engagement or a festive Tuesday. “It is not how Champagne is meant to be opened, but to me, Champagne represents celebration and joy,” says Yamoum. “I own a few sabers… One is from a French brand, Laguiole. My favorite is one I found in a flea market in my hometown in Reims, Champagne. It’s from the 19th century, in Napoleon’s era. Before you get cracking, here are a few essential tips to successfully—and safely—saber a bottle. Yamoum advises to start with a well-chilled bottle of Champagne. Prosecco will also work, but a cold temperature and the wine’s internal pressure are essential. “One time, I literally broke the whole bottle in a restaurant,” says Yamoum. “It was a Jeroboam containing the equivalent of four regular bottles of Champagne. It was a complete disaster. Also highly important, a Champagne saber will always have a blunt blade. A sharp one only adds to the risk factor. To saber a Champagne bottle, remove the foil and cage. Face the bottle away from everyone, and hold it at roughly a 45-degree angle to minimize spillage. Locate the seam that runs vertically along the bottle, and set your saber lightly against it at a slight angle. Slide the saber back toward your body, and in a clean, consistent manner, slide the blade upward along the seam with a bit of force. The saber should hit right where the neck meets the lip of the bottle, with your blade making contact at an angle. Done correctly, the top of the glass will strike off cleanly, and go flying. It cannot be stressed enough, but keep the bottle pointed away from other people at all times to avoid serious injury. Give yourself plenty of space, as the cork will travel at high speeds to a distance of up to 30 feet. “Concerning the sabering of the Champagne, my opinion isn’t very positive,” says Cédric Moussé of Champagne Moussé Fils, in the village of Cuisles, 15 miles from Épernay, France. “I think that more and more, especially with growers, Champagne is being more consumed as a wine than as a festive product. Thus, there is a notion of respect toward the product that is important. Known for beautiful French-styled tableware, Laguiole offers a range of sabers that include this classic wood-handled model. With a blade just shy of 15 inches, it’s easy-to-wield in both weight and size. Designed by Helle Damkjær in gleaming, sterling silver, it’s one of the most modern-looking options on the market today. The saber is one piece, with a bulb-shaped end opposite the blade and a length of 17 inches. The Classic Series begins with your choice of brightly hued handles and stands, to add a personal pop of color. The dark silver, carbon-steel blade and curved handle of the saber weighs nearly three pounds. It’s both functional and fresh in appearance. 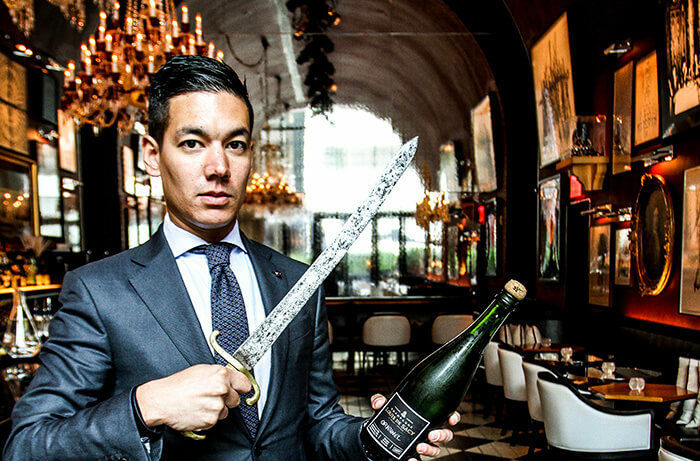 The St. Regis hotel chain encourages its bartenders to saber for big occasions. In that spirit, they forged a partnership with legendary Paris silversmith, Christofle, to produce a custom wine sword. A collector’s item, it’s only available by special order, and each purchase comes with private tutorial at the St. Regis.